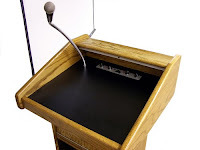 Lecterns are the slanted stands that prop up your speech and hold the microphone. Some people call this the podium, but a podium is really the platform beneath your feet. Lecterns have advantages: They're a natural focal point for the audience. They can hide your notes, a glass of water, your technology controls, a laptop, a picture of your kid...and you, the speaker. They can give you something to hang on to. Some speaking situations make it easy for you. Formal events--graduations, church services, funerals and award presentations--almost always demand a lectern, especially if you must frequently refer to notes with people's names (if you're presenting awards or degrees, for example). But in most other speaking situations, you get to choose. Use it...right: Michelle Obama, in this speech at last year's Democratic National Convention, manages to avoid all the disadvantages of using a lectern. Her gestures all can be seen over the top of the lectern, and you should practice to be sure you do the same. She rarely holds on to the lectern, choosing sometimes to gently rest her hands on it. To counteract that boxed-in look, she makes the effort to look at and turn toward different parts of the audience as she tells her story. Finally, she's telling a personal story she had already told in many campaign stops, so it's energetic and flows well. It lets me more directly connect with the audience--as a whole, and as individuals. I can walk right up to a group or a person to make eye contact. I'm more able to sense whether I'm losing the audience, and if that's the case, I can move into the crowd to change the situation and recapture its attention. Moving around keeps me energized, and that energy translates to my speaking. I can use a wider range of motion and gestures to punctuate my talk. My entire body becomes a source of motion and animates the words, as needed. It lets me be more responsive in Q&A, when I can walk up to a questioner and respond directly. Stephanie, this week, I'd like to hear what you think about using lecterns. And if you can get access to a room with a lectern, go ahead and try it out with a few remarks (perhaps practicing your message) then come out in front of it and say the same remarks. What are your questions about speaking while moving, or speaking at a lectern? What do you think about the different styles shown in the video? Which one do you think would work best for you? Great points on all examples. I tend to dislike being behind a lectern. My preference is to be closer to my audience to connect with them. But as you suggest, it really depends on the type of speaking engagement. But one thing I would say is that the speaker should remain with their strength -- and be diligent about asking about the overall setup of the room -- including whether they will have a lectern or not. This especially if they prefer one. There's nothing like a speaker showing up "assuming" they will have a lectern and there isn't one. So it's always best to be prepared.